Hardwire’s "B-Kit” Door Armor was originally developed as a spin-off of military technology where armor goes onto the outside of a vehicle. For law enforcement vehicles, the lightweight armor attaches to the outside of the car door and is color-matched so the armor blends in with the existing vehicle. Recent events around the country have shown that officers need more layers of protection. Armor buys critical time to assess a situation or survive an attack. It saves lives. Your tax deductible donation will help the Hartnett Hero Fund make the streets safer for our police officers ! With your donation, it will help purchase police car door and window armor which attaches to a vehicle’s exterior and fits into existing vehicle window openings. The window insert and car door armor provides protection against handguns and shotguns (NIJ 0108.01 Level 3A+) or rifles (NIJ 0108.01 Level 3). The "B"-Kit Door Armor was developed as a spin-off of the military armor “B-kit,” where armor goes on the outside of the vehicle. The armor panel attaches to the outside of a vehicle door using anti tamper fasteners. The lightweight, high-performance armor provides NIJ Level 3A+ protection. The armor skin is OEM Color matched to blend with existing vehicle color and accepts decals to match police department markings. Designed with durability in mind, during vehicle operation, from rumble strips to high-speed chases, the armor will remain securely in place. 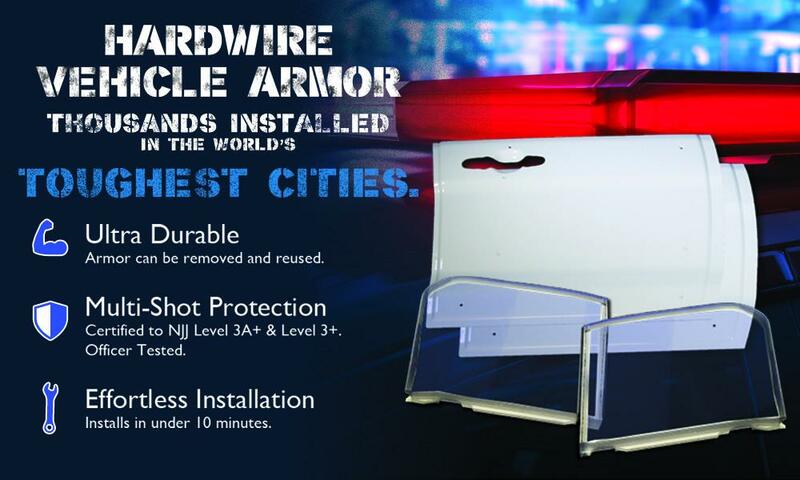 The Armor Window Insert is a custom-designed piece of transparent armor which seamlessly covers an existing window in a police car door, providing ballistic protection for the officer inside. Ballistic Protection Level: Certified to NIJ Level 3A (NIJ 0108.01); protects against handgun and shotgun ammunition up to .44magnum. Provides protection for the officer’s head and neck, especially in his blind spot where a perpetrator could approach the vehicle. © 2017 - The Hartnett Hero Fund is a Non-Profit 501(c)(3) Organization to help augment the cost of outfitting Police Vehicles with ballistic panels & vehicle armor.